I’m pretty sure many of you will recognize this plastic tub, especially if you live in New England. At the Parris House, the times for this are Christmas and Valentine’s Day. Now, I don’t make this recipe. I do all the cutesy decorating, bake some kind of dessert, and buy conversation hearts and gifts. This year dessert was cherry pie. I got the idea for punching heart shaped holes in the crust from 1840 Farm, but, of course, my version looks more like a “nailed it” meme than a faithful replication of the beautiful job Jennifer Burcke did with her pie. No, it is my husband Bill who always makes the Never Fail Fudge. 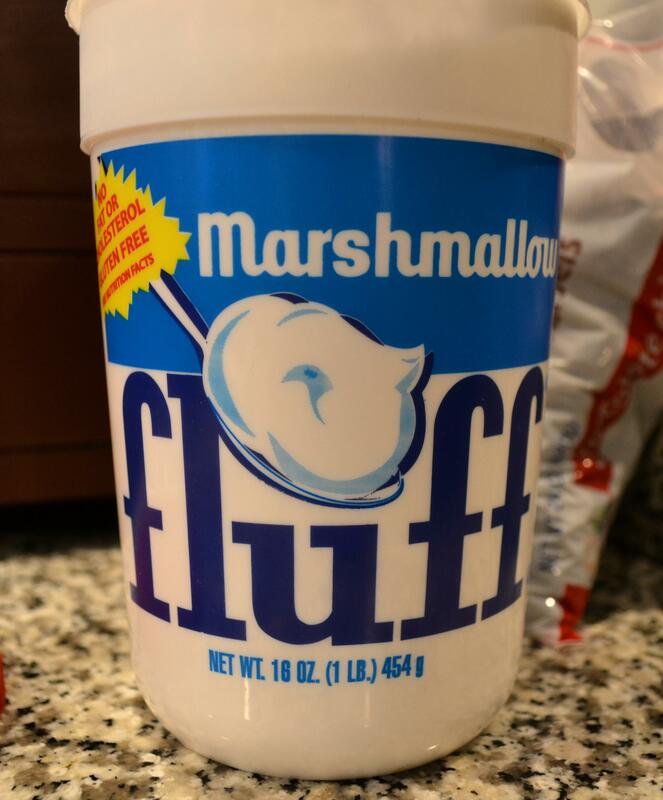 And before we go any further, I’d like to say that the trademark Marshmallow Fluff and the recipe Never Fail Fudge are the intellectual property of the Durkee-Mower company in Lynn, Massachusetts. I have full permission to blog this recipe. Do you know why? Because I actually spoke to the super nice owner of this company on the phone this morning, and had the privilege of thanking him personally for this confection, which, I might mention, while not a health food is also not chock full of bizarre chemicals that no earthly mortal can recognize. 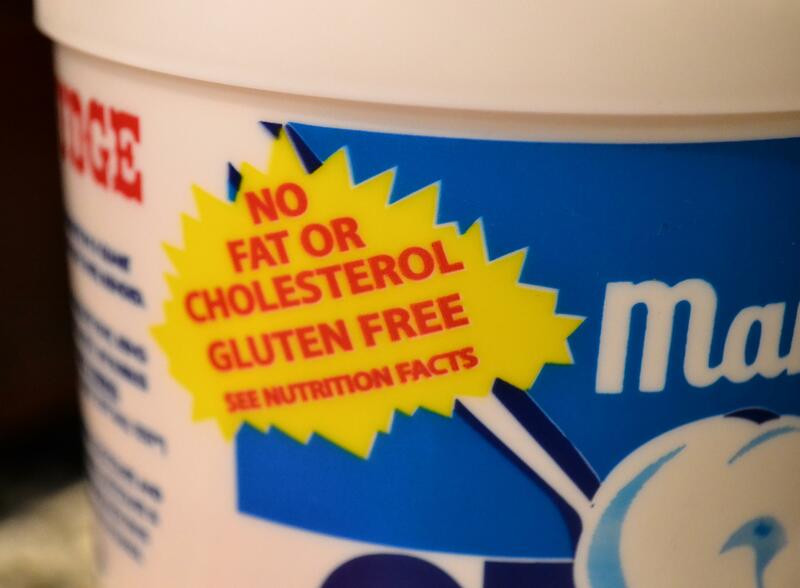 The sole ingredients are corn syrup, sugar, dried egg white, and vanillin. Period. Straightforward and no nonsense, the New England way. And while the Fluffernutter sandwich is not really for me, it too is something most kids in this part of the country have packed in their lunchboxes more than a few times, a simple straightforward treat that they could make themselves. It turns out, actually, that this straightforward New England confection has been manufactured since 1920 and the company is still in the same family. The history is actually very interesting and can be found here, on the company website. You can also “like” Marshmallow Fluff on Facebook, which is kind of fun. There are also many recipes on the website, so surf around. 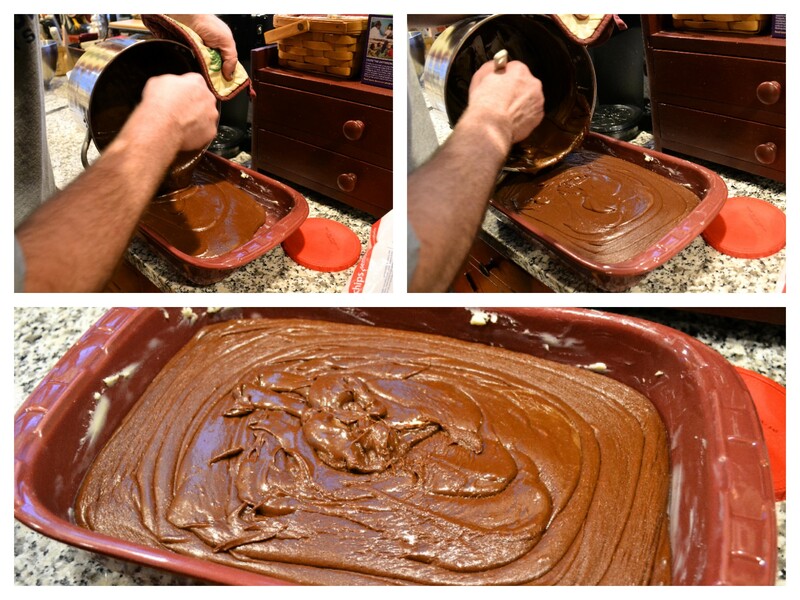 Never Fail Fudge is a rich, deeply chocolate, soft fudge that is truly never fail. We have not ever had a batch go wrong. If you do have a batch go wrong, the company website has an FAQ for that, but really…just follow the directions on the bucket. Here we go. 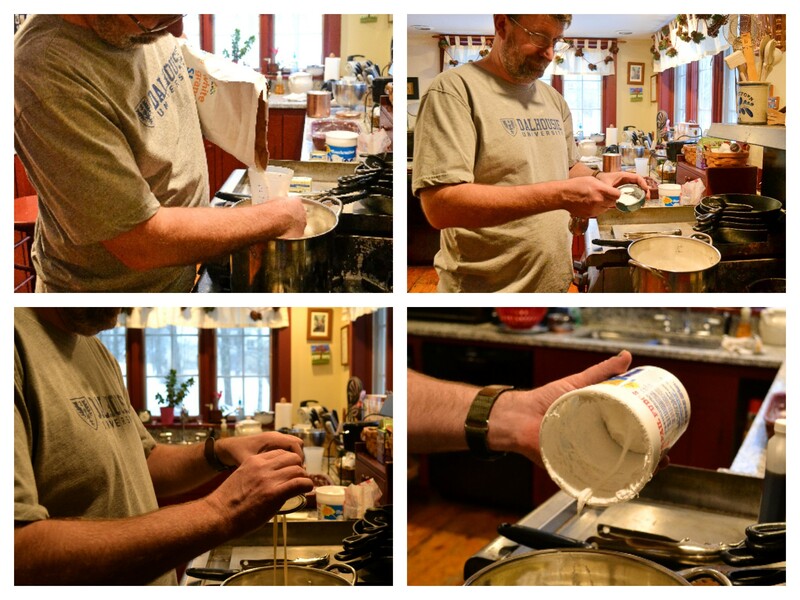 Bill super greases a 9×13 ceramic cake pan with lots of butter. The directions on the tub suggest 2 – 9x9s, which would be fine also, of course. 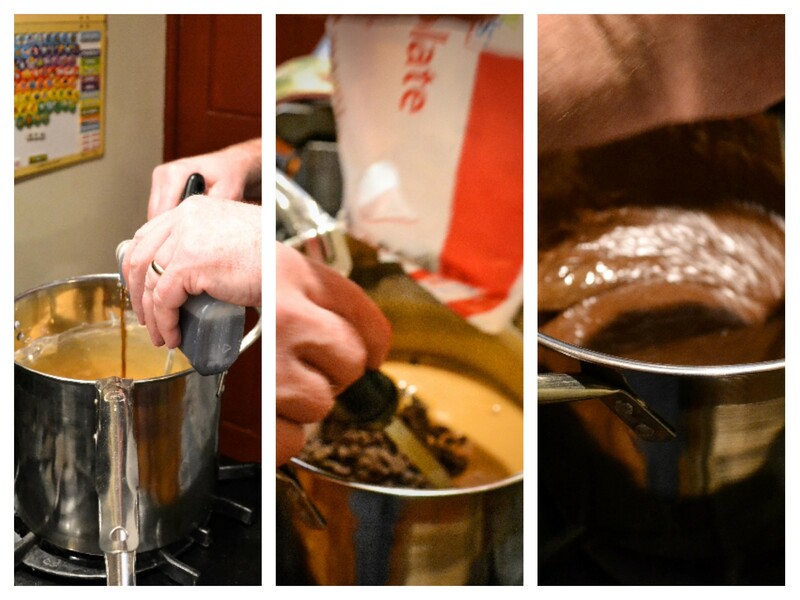 He gets all his ingredients together prior to starting the recipe so that he is free to stir the fudge and pay attention to the temperature of the mixture. The ingredients are: 5 cups sugar, 2 small 5 oz. 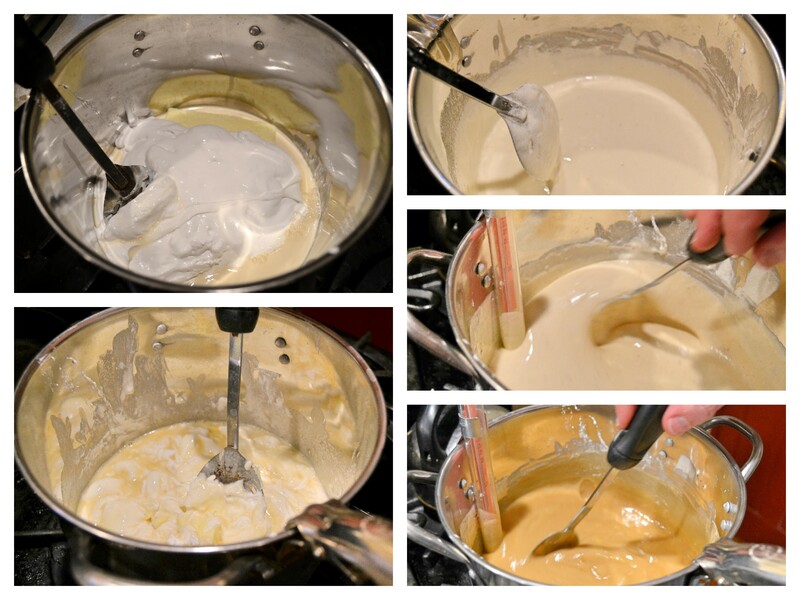 cans of evaporated milk, 1/4 pound butter or margarine (we always use real butter), 1 – 16 oz. tub Marshmallow Fluff, and 1 teaspoon salt. These are the initial ingredients. Toward the end you add 1.5 teaspoons vanilla, 1 cup walnut meats (if desired – Bill doesn’t like nuts so we never get this part), and 2 large 12 oz. bags of semi sweet chocolate chips. This recipe in full is on the Marshmallow Fluff tub and the website. Bill combines the first 5 ingredients in a large stock pot. The recipe suggests a 5 quart saucepan. All of these ingredients are stirred until well blended over low heat. Once combined you will bring the ingredients to a boil, and we recommend stirring continually so it does not stick to the bottom of the pan and/or burn. Boil the mixture slowly, continuing stirring, until it reaches the soft ball candy stage. The recipe says this will be about 5 minutes, and interestingly, we use a candy thermometer but, in my conversation this morning, the company owner said he does not. My husband is an accountant, and also our primary cold process soap blender in Maine, so you can imagine that he likes the precision of the thermometer. If I made this fudge I might just use the more subjective approach. Either way, remember, it’s never fail fudge. You will notice, as this is combined, stirred and boiled, it gets a little darker over time. It’s almost as though it’s caramelizing a little bit, but I don’t know for sure. Once you have achieved soft ball status with this mixture, it’s time to remove it from the heat and add the vanilla, the nuts, and the chocolate chips. Stir until everything is blended and melted together. Now it’s just a matter of pouring it in to your waiting buttered pan or pans. It will be very hot at this point, so be careful. Allow to cool completely and then you can cut it in to chunks of your preferred size. It yields about 5 pounds of fudge, so this is a great recipe – and very economical – for gift giving as well. We give a lot of it away, and it always seems to be welcomed with enthusiasm. As you can see in this next photo, Bill cuts the chunks pretty large. He made that ceramic bowl they’re sitting in too, but that’s another blog post. 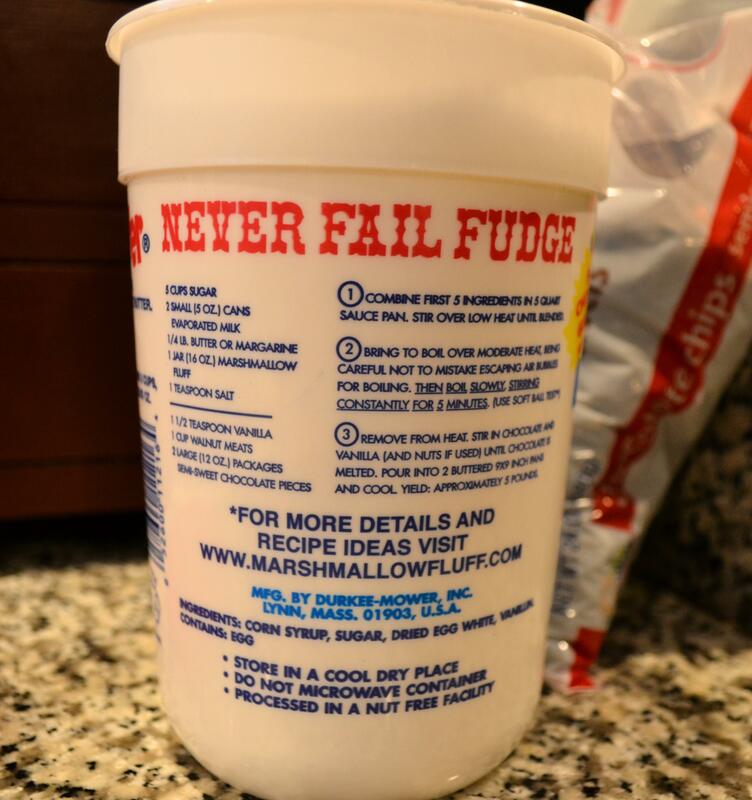 I know from posting about Never Fail Fudge on our Facebook page that many of you are familiar with it, make it, adapt the recipe for different flavors, etc. 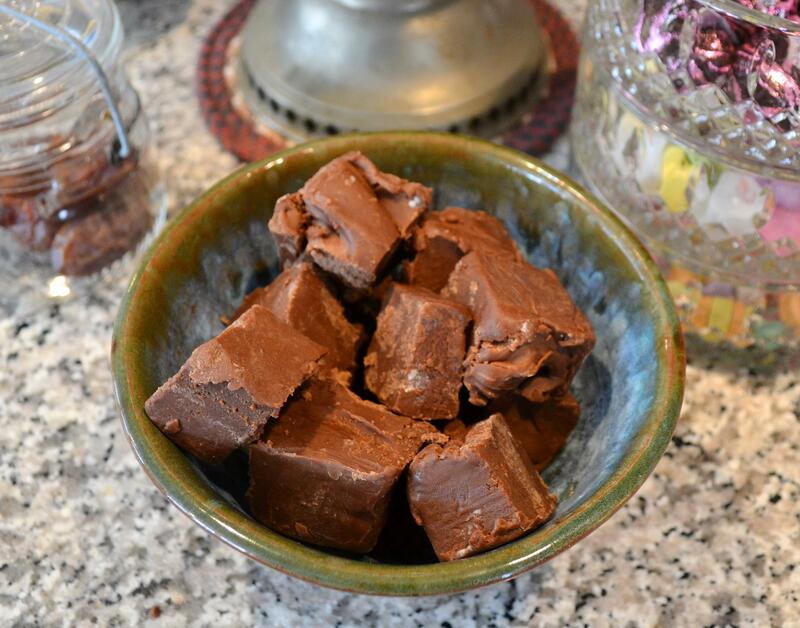 Hopefully some of our readers are new to it and will try this amazingly simple and delicious fudge recipe. Many thanks to the Durkee-Mower company for permission to share, and for answering my phone call so promptly in snow bound Lynn, Massachusetts. Cindy’s Quest for a New Kidney – Let’s Make It Happen! Thank you! I think this recipe just brings out a lot of memories and feelings for people. I really thought twice before making a blog of it because it’s not our original recipe, but something about it just kept calling to me. Kind of like the fudge – lol – which honestly, I only rarely eat anymore. Still, like I said…a time and a place! I’m glad you have a way of getting it! I know! It makes it like a special treasure when it comes!